I’ve tried on a number of occasions to eliminate McDonald’s from my diet. The first time I tried was a few years back, after reading Eric Schlosser’s non-fiction work, FAST FOOD NATION. I remember going to buy fries for the last time before reading the chapter entitled, “Why the Fries Taste so Good.” I had to go for that last fry before I could never look at them the same way again. I went for months without a Big Mac or a Quarter Pounder with cheese but it didn’t last. Eventually I succumbed to my cravings that persisted despite the time that had elapsed. I knew what I was doing was wrong but as I bit into my two all-beef patties, special sauce, lettuce, cheese, pickles and onions on a sesame seed bun, I conveniently forgot about all the chemicals in the meat, the subliminal advertising geared towards toddlers and the migrant, illegal workers in dangerous meat rendering factories that made my burger possible. No sooner had I had my last bite did my stomach twist into a tangled mess. The pain was both horrible and familiar. Unfortunately, Richard Linklater’s narrative interpretation of Schlosser’s novel is nowhere near as nauseating or as a big a turn-off as the feeling of a Big Mac sitting at the bottom of your stomach. The decision to translate FAST FOOD NATION from a non-fiction work of in-depth investigative journalism into a narrative film is a bold one. I was apprehensive at first but Schlosser’s involvement co-writing the screenplay with Linklater made me less so. Shaping facts into a story certainly humanizes the global implications of the fast food industry but if the narrative is not compelling then there isn’t much of a point. FAST FOOD NATION tells different stories to show the wide reach of how many are affected by the fast food industry. Greg Kinnear plays Don Anderson, an advertising executive responsible for The Big One, the latest burger success at Mickey’s, the fictional fast food chain at the center of the film. Don must investigate reports that there are significant traces of cow manure in the meat (Fun!). Ashley Johnson plays Amber, a teenage Mickey’s employee who juggles school and work while she begins to see her role in the corporate machine that is waiting in her future. Wilmer Valderrama and Catalina Sandino Moreno play Raul and Sylvia, two Mexican illegal immigrants who have been brought into the United States specifically to work at the rendering plant that manufactures the millions of patties that become The Big One. Very little is revealed about the characters themselves as they are merely symbols for the bigger picture. Consequently, there is very little identification with the film. A film that is trying to tell everyone, “America … this is what you’ve become,” needs the audience to feel like this is their America. 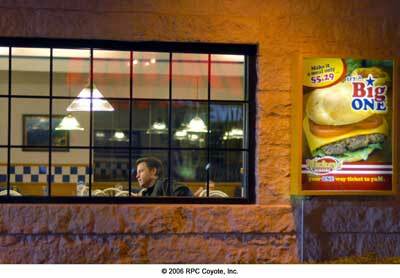 What FAST FOOD NATION best exemplifies is America’s complacency with the progression of its society. The problems don’t stop at Mickey’s. The fast food industry is merely just one faceless industry that is driving the American people into hopeless futures. Kinnear’s Don is a prime example. He has spent his life packaging products, feeding them to people the way they like it. All the while, he has also been feeding his convenient lies to himself as well. A successful burger comes at a cost and as he travels from his board room to the assembly line and begins speaking with people who don’t have any stake in the production of The Big One, he understands that there are truths under his lies that he cannot go on ignoring. By the time we see him bite into his third burger, his apprehension to do so is rampant. Yet, he still takes that bite. This is what we do. We get fed a ton of information from different angles. The product pushers tell us how wonderful it is and the non-believers prove otherwise. Schlosser’s book, which clearly details all the subtle atrocities the fast food industry unleashes into the fabric of America to make one more dollar at the expense of its loyal customers, is well researched and fact-checked. The flip side to the convenience of fast food, from obesity to the exploitation of underage employees, is being discussed by too many people and with increasing validity to be ignored. Yet millions still take that bite. Linklater does not shy away from expressing his disappointment in the American people nor does he mince words about his lack of optimism relating to making change on the subject. Each character’s story is brought to a close and none of them are any better for any of their efforts. Some end up exactly where they wanted not to. Some end up continuing to support the industry despite their newfound knowledge. All these choices are made to ensure money is still coming in, to ensure the American dream is still within reach. Even the youth of tomorrow fail at their attempts to affect the future. The attempt itself does show a trace of Linklater’s hope, albeit it fleeting. Despite all this, Linkalter still wants to do his part. The last ten minutes of FAST FOOD NATION bring about some of the more gruesome footage found in the film. We finally get a tour of the “kill floor” at the rendering plant, with plenty of blood and eaad cow to go around. The nausea comes too late in FAST FOOD NATION but you certainly won’t be rushing for another burger any time soon.